Eating enough of the right foods with protein is an important dietary requirement for optimum health and vitality. Generally speaking, any healthy diet should have a good supply of protein. Although the technical definition of protein is 'any large molecule with at least one long-chain amino acid', most of us think of protein as something in our diet that makes us grow strong and healthy and keeps us that way too. Generally speaking, as a race, we associate foods that provide this strength giving nutrient to be meat, milk and eggs, period! This is not the case however, as there are many other foods with protein that provide our bodies with this important building material in a far healthier way. Generally speaking, proteins form all cells and tissues of the body including; muscle fibres, bone, marrow, hair, nails, enzymes, hormones, blood, antibodies, haemoglobin, and everything else in fact. Protein is also responsible for many other functions within the body including; the transportation of vital substances such as vitamins and minerals, as well as muscle movement too. Without proteins we simply could not function. As we can see, every living cell within the body contains some form of protein. 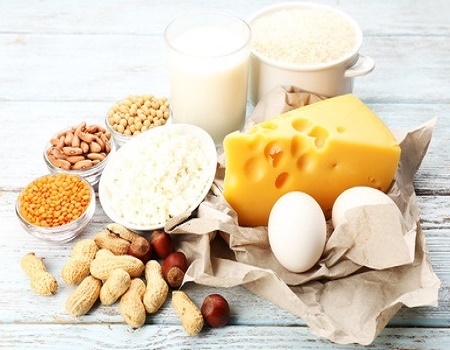 Our bodies need to consume and digest enough foods with protein to build and maintain the health of all our tissues, from bones to muscles, skin, hair, nails and teeth. We get proteins in our diet from a variety of foods that include meat, dairy products, nuts, grains and legumes such as beans and peas. Meat and other animal products are termed 'complete proteins'. Complete proteins contain all of the nine essential amino acids that the body is unable to make on its own, and therefore, relies on certain foods with protein for its supply. Plant proteins are 'incomplete proteins' as they generally do not each contain all of these nine essential amino acids. Eating a variety of 'incomplete proteins' is sufficient to supply your body with all nine essential amino acids. This is discussed in more detail further down. Without seeming to state the obvious, the best foods with protein are the healthiest, and the healthiest foods with protein are those foods with the least amount of saturated fat. Non-vegetarians should select low-fat cuts of meat to minimise their intake of saturated fat. Red meat and saturated fat is undeniably related to heart disease which is the biggest killer in the Western world! With this in mind, the best meat foods with protein are those with the least amount of saturated fats, of course. Generally speaking these are fish and chicken. Beef especially, but lamb also, are unhealthy sources of protein as they contain higher levels of saturated fats even if you select an extra lean cut of these meat sources. Of course, a leaner cut of beef would be healthier than a less lean cut of the beef, but overall, red meat whether lean or not, is higher in saturated fats than fish and chicken and should be avoided permanently if you want to seriously reduce the risk of heart disease and other related conditions. To be honest, I think all meat should be eradicated from the diet to reduce arteriosclerosis (furring of the arteries) but I guess I am a little bias as I've been a vegetarian for nearly thirty years! The fundamental difference between foods with protein and non-protein food sources is the unique combination of amino acids that they contain. Amino acids are formed from carbon, hydrogen, oxygen and nitrogen, and bond together to form protein molecules which in turn become the basic building blocks of all life forms. There are 20 regular amino acids required by humans for making protein. These are necessary for the growth and repair of tissue, red blood cells, enzymes, and other materials that make up our bodies. There are over 100 other amino acids found in other life forms such as plants. There are two main types of amino acids, 'essential' and 'non-essential', but now also 'conditionally essential'. Essential amino acids can't be synthesised by our bodies but are required by them so we must obtain them from various foods that contain them. Conditionally essential amino acids are those that are not considered essential except under certain conditions such as extreme trauma, surgery, or wounds for example where these amino acids would aid repair and recovery. Non-essential amino acids can be synthesised by our body so it isn't quite as important for us to obtain them from food. As far as foods with protein are concerned, any protein source that contains all 9 of the 'essential amino acids' is classed as a complete protein, and any food that does not contain all 9 of the essential amino acids is classed as an incomplete protein. Many incomplete proteins and even some complete protein sources are great vegetarian options. Since different plant-based foods contain different essential amino acids in their structure, eating a varied diet consisting of whole grains, vegetables and legumes such as chick peas, lentils, green peas and other pulses will ensure that you get all of the essential amino acids in your diet. Also, some plant-based foods such as soy are similar to animal-based foods in their essential amino acid structure. Basically, if you're a vegetarian or thinking of becoming one, eating a variety of different foods with protein either on the same day, or over a few days, will provide your body with enough complete proteins and essential amino acids for your body to function properly. While the human body needs a daily supply of protein in order to function properly, like all things, eating too much can have the opposite effect and is therefore not healthy for us. If you eat the traditional American diet without concern for health, you'll probably consume far more foods with protein than your body actually needs. It’s common for most people to consume large amounts of protein at every meal because it’s the focal point of most dishes and most people overestimate how much protein they need. There are two ways to think about recommended daily allowances of protein. You can follow general guidelines according to your age, or you can be more precise by calculating your daily allowance according to your body weight. If you go by age, you need just 13 grams of protein as a toddler under the age of three, and that goes up to 19 grams for the 4-8 year old age group and 34 grams for kids between 9 and 13. Once adolescence is hit at the age of 14, boys require more protein than girls. Until the age of 18, the recommended daily allowance for boys is 52 grams, but it’s only 46 grams for girls. Teenage boys and young male adults naturally have more muscle in their bodies than most girls, so that explains the greater need for foods with protein in teenage boys. As adults, women need approximately 46 grams of protein daily while men need approximately 56 grams. To put this in perspective, a 4-ounce chicken breast contains approximately 36 grams of protein. That means an adult woman can consume less than two chicken breasts to meet her daily allowance. Most adults eat far more than that if meat is consumed at every meal, which is usually the case. These figures are made clearer by the simple table below. Note: the big problem with these age related protein requirements is, they make everybody in each age group the same. A naturally bigger child or person will require more protein for optimum growth, development and maintenance than their smaller counterpart. These age and gender related Recommended Daily Allowances at least give us a decent enough, rough guide. For a more individual and precise idea of how much protein your body needs each day, multiply your body weight in pounds by 0.36. It’s estimated that the adult body needs approximately 0.36 grams of protein for every pound of body weight, so this simple calculation will tell you how much protein you should ideally consume each day. Don't forget, this varies from one country to the next, but this is a safe daily recommendation under normal circumstances. So, to give you some idea, a ten stone man for example weighs 140lbs as there are 14lbs in one stone. 10x14=140. 140x0.36=50.4. So a ten stone man would ideally need 50.4g of protein a day for optimum maintenance and repair. 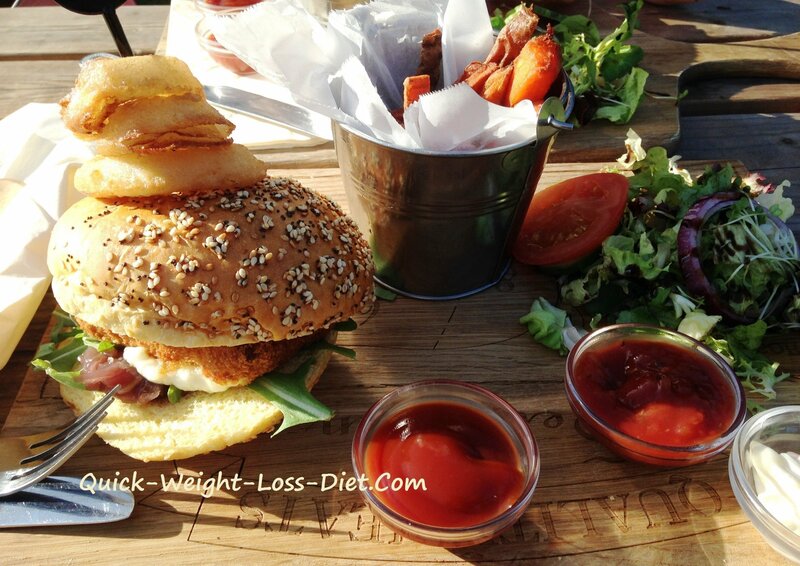 If you’re in the process of losing weight, you will naturally start to need less protein as your body weight reduces. Does an Active Lifestyle or Pregnancy Require More Protein? In a nutshell, (no pun intended) yes. The above ranges for the recommended daily allowance of protein are used for most people living low to moderately-active lifestyles. You'll more than likely need to consume more protein each day if you’re an athlete with a vigorous training routine. Bodybuilders know all too well that they need to increase protein intake or they're just wasting their time in the gym. These types of athletes work out to extreme levels and will naturally need more protein to recover from those muscle-tearing workouts that are designed to increase muscle mass. The protein powder to the right is a very healthy way to supplement your diet if you feel, or know, you aren't getting enough protein due to either increased exercise, pregnancy, eating a vegetarian diet, a vegan diet or for one reason or another you just aren't eating properly. See the pulsing website in the UK. An active person may want to consume 0.5 grams (1/2g) per pound of body weight instead of the RDA of 0.36 per pound of body weight. Professional athletes or others leading extremely active lives with lots of training may go as high as 0.7 grams per pound or higher. Professional bodybuilders consume about 1g of protein for every pound of their overall body weight. The main problem for these athletes is that high quality protein is in fact very expensive, and if the body can't absorb all of what is being consumed, then good money is wasted. Many athletes may not realise this important fact about protein assimilation. Too much, is often, too much! Pregnant women and breastfeeding Mothers are recommended to consume more protein to provide essential amino acids for the growing foetus and to supply nourishing milk for a growing baby. The recommended daily allowance is around 70g of protein per day, but this is a general guide to all. For a more individual and precise intake of protein for pregnant Mothers, the recommended intake is around 0.5g per pound of the Mother's body weight. Simply multiply your body weight in pounds by 0.5. The answer is your ideal protein intake, per day, in grams. Remember, there's 14lb in one stone. As we've already established, it's far better for you to eat low-fat healthy foods with protein to reduce saturated fat intake to a bare minimum. This will undoubtedly reduce your risk of developing heart disease and other related medical conditions in the long-run. Can I eat too many Foods with Protein? Eating too much protein is most certainly bad for your health. The body can't store it so the liver converts any excess into glucose (blood sugar) and by-products such as urea (the major nitrogenous end product of protein metabolism). This has to be eliminated from the system which places extra strain on the kidneys as well as increasing chronic dehydration. Too much blood sugar can also turn to fat as well as feeding pathogenic bacteria and yeast, such as Candida albicans (candidiasis). It has also been said that eating too many foods with protein can also produce acidic urine which can lead to a loss of calcium from your bones. This can increase the risk of developing Osteoporosis which makes bones brittle and more likely to break. Once you determine how much protein your body actually needs for proper repair and maintenance, you may realise that you don’t need to consume foods with protein at every single meal, and you most certainly don’t need to consume large portions of meat at meal times either. The recipe for a healthy meal and lifestyle is a reasonable serving of low-fat protein sources, balanced with fruits, vegetables and small amounts of whole grains. Remember, foods with protein aren’t limited to meats. You'll take in protein when you consume cottage cheese, yogurt and other dairy products, and it’s contained in many plant foods as well. This will be clearer when you see the foods with protein list further down the page. Keep variety in your diet by mixing up your choice of foods with protein. Try tofu and other vegetarian foods that also provide protein for a healthier heart and arteries. If you're trying to give up red meat, consider getting your protein from fish such as salmon and other seafood options which provide your body with omega-3 fatty acids. You’ll benefit on multiple levels when you add fish to your diet, especially if you can give up red meat and other products derived from it. Not getting enough good quality foods with protein in your daily diet is just as important as not eating too much. Getting the balance right is the key to a healthy lifestyle. While you may not need as much protein as you once thought, it's important that you do consume enough of the 9 essential amino acids found in complete proteins. Alternatively, combine a variety of foods with protein to make certain you get them all. Below is a list of common foods with protein. This is a rough guide to the protein content in these foods measured in grams of protein per 100 grams of each food source. The many sources of this information are inconsistent, but this list does at least offer a good, albeit rough, idea of the protein content of these foods. Personally, I am a vegetarian of some 30 years and as I have said before, red meat especially is not a healthy option for human consumption in my personal opinion, whatever nutrients it contains. I originally started the vegetarian diet for ethical reasons but had stopped eating red meat long before in my early training days for health reasons. I say this as I do not want people to think I have some hidden agenda to try to convert people to stop eating meat because I care about animals. On the contrary. What foods you choose to get your protein from is your choice and your choice alone, but my advice to you is to significantly reduce or give up all red meet completely if you want to increase your life span. The point is, this page is about foods with protein so I'm obliged to list the main sources of protein for educational purposes which is why it's here. Please also take a look at the vegetarian diet (coming soon) and vegetarian facts for some guidance on this often very controversial subject. Note: all information given below is approximate as there are differing opinions even from so-called reliable sources as to how much protein and other nutrients are in any one particular food source. Please take the time to read the product labels on all foods that you purchase and don't rely solely on the information provided on this website. Soybeans - 29g per 100g? wow! Note: I find it very interesting that the most potent foods with protein happen to be from vegetable sources, peas in fact? Quite incredible really, don't you think? I used to take quite a bit of this particular pea powder myself, as I'm a vegetarian and needed to supplement my diet when I was weight training not so long ago. I actually took that photo and know that the 82g per 100g protein content is true. Take a look at the Pulsin website (UK) for yourself. Other foods with protein that rank high on the list are soy beans and other legumes. 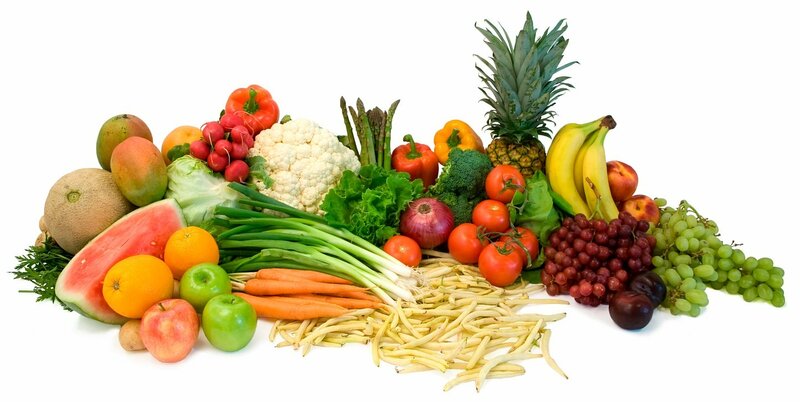 Eating a variety will ensure you get all the essential amino acids too. Spirulina and yeast are other powerful foods with protein. In fact, Spirulina contains all of the 9 essential amino acids which make it a complete protein. As you can see from this list, there are many different foods with protein and many of which are healthy and ideal for the vegetarian or vegan diet. If you are not one of these people, I sincerely hope that you can see the benefits of not eating too much meat for your long-term health and hopeful longevity.